Spin This: "They Don't Care About Us," "Live and Let Die"
The floodgates are starting to open for classical instrumentalists breaking into mainstream pop. Acts like chart-topping violinist Lindsey Stirling and UK string quartet Escala are commanding the attention of the YouTube generation and are turning classical-pop into a delectable side dish. For Croatian cello duo 2CELLOS (Luka Šulić and Stjepan Hauser), the timing couldn’t be any better. 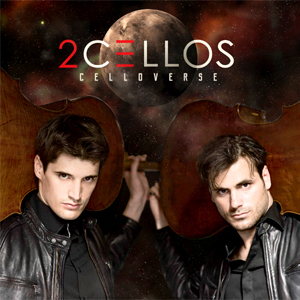 Now on their third disc, the two are expanding forward into fearless, tougher cello rock with Celloverse. Some of the more impressive performances include dramatic remakes of Michael Jackson’s “They Don’t Care About Us” and Paul McCartney’s “Live and Let Die,” the latter featuring virtuoso pianist Lang Lang. But as the pair seek for ambition on the thirteen-track event, they run into a few hiccups. The pace on Aloe Blacc’s “Wake Me Up” is way too swift for enjoyment; Mumford & Sons’ “I Will Wait,” still delicately tied to its Americana hues, seems to be vexed with a horse-like adrenaline surpassing the pace of the original. And that horse galloping agenda seems to be ever consistent on Celloverse as the album’s opener – a mashup fantasia of Gioacchino Rossini’s popular William Tell Overture (think Looney Tunes instrumentals) and Iron Maden’s “The Trooper” – uses the same horsepowered heartbeat. They suddenly calm things down on their closing cut – a calmer, less-broody take of Radiohead’s “Street Spirit (Fade Out).” The album title track, the sole original by Hauser and Šulić, places their harmonies on a very subtle disco beat. The guys jump from dueling to complimentary solos quite often, even displaying lots of incredible presto in their performances. On the last few seconds of “Hysteria,” their speeds reach such a rapid acceleration that it seems too hard to believe. The same can be said of their take of AC/DC’s “Thunderstruck,” which is played entirely without any extra instrumentation. Listeners will walk away with one of these two conclusions: Either they are trying hard to hammer down a stylistic point or thrusting some audacious self-serving highfalutin into our ears.